Today we’re going to shed a light on an interesting topic. PHP internals, this term is used to refer to all those things that are not directly accessible to userspace code (php script). 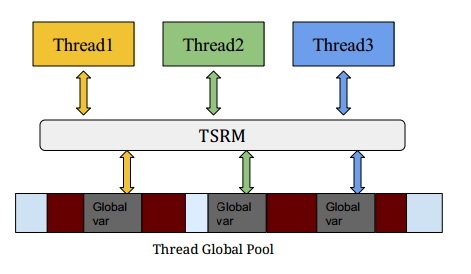 This post explains the concept of (ZTS) Zend thread safety in multi-threaded environment, PHP lifecycle and a detailed analysis of TSRM mechanism. Thread Security means to guarantee a safe access to public resources in a multithreaded environment. Generally each thread has a private stack but all threads share a common heap. In C language, when a variable is declared outside of any function, it becomes a global variable, then this variable will be assigned to the process of shared storage space, different threads refer to the same memory address space. At first PHP had no concern for thread security because there was no resource competition or concurrency between threads ( single-threaded environment ). Every PHP instance go through numerous events involving Request Init, Module Init and finally Shutdown events. The initial startup, before page requesting (SCRIPT) begins, PHP interpreter calls every extension’s MINIT (Module Initialization) method to initialize extension modules. During this phase extensions declares constants, register resource, stream, and filter handlers that all will be used in next requests. Once a request is made, PHP interpreter sets up an environment to operate requests which includes a symbol table (php variables and could be Engine’s vars too). PHP loops through its extensions again and calls each extension’s RINIT ( Request Initialization ) method which run at the start of every page request. During this phase extensions reset global variables to default values ( either in multithreaded env), pass variables into the script’s symbol table. Finally when the request has completed execution, due to the end of scripts file or by exiting through a die() or exit() statements, the cleanup process start by calling each extension’s RSHUTDOWN (Request Shutdown) method. RSHUTDOWN corresponds to auto_append_file configuration directive. But the difference between RSHUTDOWN and auto_append_file, is that RSHUTDOWN don’t get interrupted by a call from exit() – die() will always be executed, while auto_append_file is skipped by such calls. After RSHUTDOWN methods have completed, symbol table and non-persistent resources are destroyed. Now it’s SAPI and web server turn to shutdown, PHP loops through each extension’s MSHUTDOWN (Module Shutdown) method and unregister any kind of remaining resources. int done; // a flag to identify resource usage. The main task here is to initialize the two data structures mentioned above. (mentioned in the the resource sizes table). Finally it allocates a mutex to handle resources allocation and usuage without mutual interference between threads. The second function ts_allocate_id, significantly the most important in the TSRM mechanism, needs to be carefully analyzed. Generally speaking this function is used to allocate global resources in a multithreaded environment and return the resource ID so let’s discover how it works. You can find the source code here : TSRM : ts_allocate_id. TSRM : ts_allocate_id (link 2). We call this function during the extension’s MINIT process, TSRM layer is notified with the size of data which needs to be stored by the extension. Following that TSRM adds the number of bytes to its running total of data space requirements then returns a new, unique identifier for that segment’s portion of the global thread’s data pool. It’s used to apply a global variable in a multithreaded environment (in ex : Apache Worker MPM ) and return the ressource ID. Next PHP kernel lock the calling thread using tsrm_mutex_lock function to handle concurrency issues. 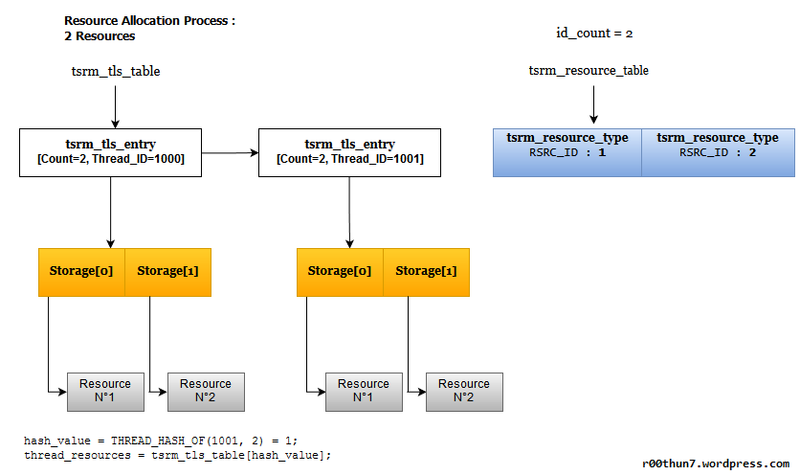 Once locked id_count is incremented, to generate a new resource ID, after generating a resource ID, it gives the current location of the newly allocated storage, each resource will be stored in tsrm_types_table. In fact, we can consider tsrm_types_table a sort of HashTable, its key is the resource ID and value is tsrm_resource_type structure. Later it will assing resource data to resource_types_table and set done to 0 which means that the resource is currently in use. After the allocation of resource ID, ts_allocate_id function will traverse all the threads and for each thread’s tsrm_tls_entry allocate the resources required memory space based on id_count. More precisely it will check if the global variables recorded count is less than the id_count and enlarge the existing global variables (resources) storage array. Then allocate the size of ressources starting from the last count and call the resource constructor. Finally it’s time for tsrm_shutdown function to shutdown TSRM and do some memory cleanup job. tsrm_shutdown pass through all the existing threads, save the next thread node before freeing the current thread, thus the function invoke the resource destructor and start freeing each element from the global variable storage array. Finally release the tsrm_tls_table, so this way we shutdown the thread-safe memory manager. In fact the purpose of calling tsrm_startup with 1 as value for expected threads, is that in most cases PHP still used with single-threaded environments so it’s a good reason not to waste memory space. So by this we come up to the end of this paper. Stay tuned for more interesting stuff. Extending & Embedding PHP Book.